Damien Dubrovnik is the chosen moniker of Danish duo Loke Rahbek and Christian Stadsgaard, who are also integrally related to the Posh Isolation given they run the label (and having established a musically diverse roster with over 150 releases issued since 2009). Although being generally aware of Damien Dubrovnik’s activates over recent years (i.e. focused experimental noise/ industrial material); ‘Vegas Fountain’ completely caught me by surprise by how sonically refined it is. Evidently the material featured on this album has been first developed through live performances, which can certainly be heard in the meticulously layering and detailed construction of these experimental noise compositions, despite its broadly abstract and ‘non-song’ based format. ‘On the Double’ is the opening 11 minute statement of intent, which includes a minimalist opening of atonal synth drone washes, sporadic knocking sounds and distant metallic clatter. It then gradually adds additional elements for elevating effect, including plucked bass and deep bass thuds to chart an upwardly building trajectory of tensile experimental electronics. Despite hitting quite heavy sonic territory by the tracks end, there is still an amazing degree of clarity, space and separation of tonal sounds, where it is minutely detailed and highly complex in construction. Spoken vocals also feature, which increase in urgency as the track progresses and noting their delivery in a dour and anxiety riddled style, it brings to mind the spoken vocals of Martin Bladh. Yet equally I don’t get the impression that Damien Dubrovnik are specifically inspired by or seeking to emulate Martin, rather they have simply ended up in a similar frame of presentation (…and regardless of this comparison the vocals of Loke perfectly suit the clinical and focused tone of the album). The next instrumental piece ‘Interior 1: Upper Lip’ is much short and straight forward piece of abstract industrial minimalism, with an assemblage of analogy rhythmic pulses, higher pitched needling tones, and semi buried knocking thuds which interweave and overlap. The final track for Side A is ‘Fingers Into Majorelle’, a moody industrial soundscape of depth sounder/ radar pulses, lone reverberating piano note, sweeping textural sounds and spare noise blasts. With the tensile clinical atmosphere being ramped up over its span, in opposition the vocals are presented in close proximity (…as is they are being whispered directly into the ear of the listener). 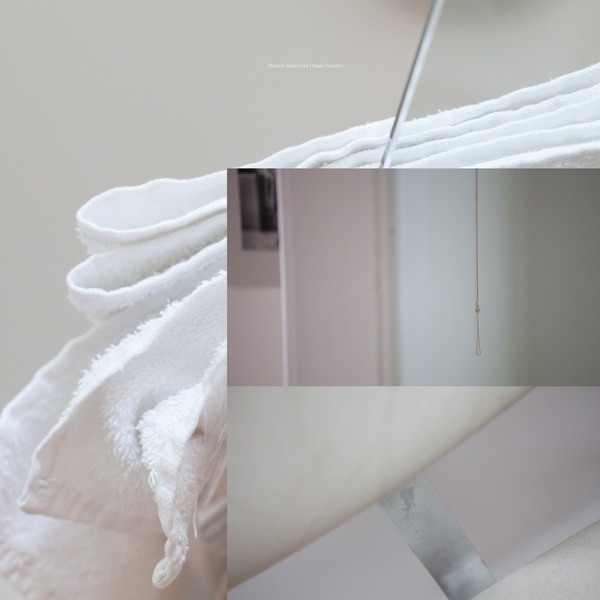 Side B opens with ‘Interior 2: See Water Glass’ which seeks calmer levels of sonic expression via a piece of droning minimalism, where within its cinematically tinged framework hints of slightly harsher industrial elements gradually make an appearances as the track elevates with weighty sonic momentum. Following the sparse and tonally abstract and ‘echo chamber’ styled ‘Interior 3: Matching Window Blinds And Lampshade’, the title track closes out the album at close to 10 minutes. ‘Vegas Fountain’ effectively arcs back to the feel and sonic presentation of the first track, where it charts a course from minimalism to heavier sonic realms. Here shrill atonal drones, sparse metallic textures and thudded sporadic piano notes flesh out framework, which is then sonically ramped up over its duration into a rather tensile atmosphere, including (again) the anxiety infused and slightly treated spoken vocals which build to roaring intensity by the end. Likewise a sub-orchestral synth line provides a more maudlin aspect to counterpoint the harsher elements of this composition. Through their sonic, visual and lyrical approach, Damien Dubrovnik are creating a quite different and more ‘artistic’ take on elements of noise, industrial and power electronics and in the process sidestepping many of established clichés relating to such music. Rather than merely emulating established themes and directions, their divergence of approach makes them all the more intriguing; where psychoanalytical themes are hinted at through their fragmentary style of lyrical writing, rather than it being a barrage focused or over the top type lyrical approach. Although linage can be drawn to earlier material of Damien Dubrovnik, here the refinement of approach and clarity of production means it is also leagues ahead of their own prior output. With ‘Vegas Fountain’ representing such a strong album of clinically tinged, sonically diverse and extremely intense experimental noise/ industrial offerings, it represents their pinnacle release to date; meaning it is also going to be very interesting to see where the Damien Dubrovnik takes their sound next. 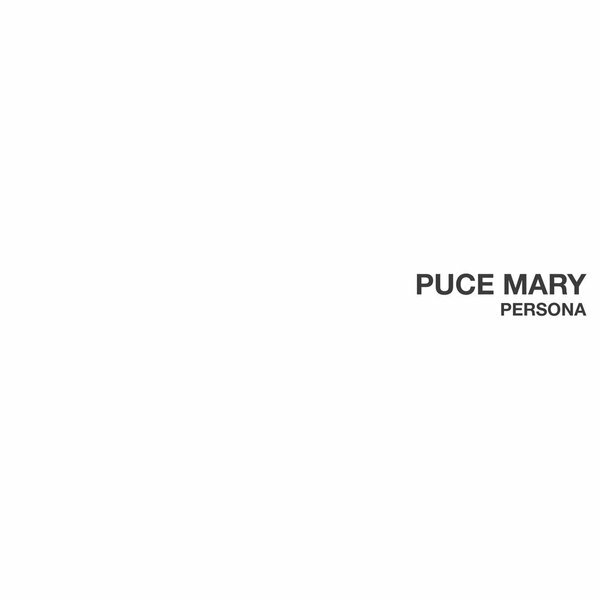 Puce Mary is the industrial/ power electronics project of Frederikke Hoffmeier who since 2010 been steadily raising her profile via a series of releases, each of which are displayed a gradual improvement in sound, focus and direction. ‘Persona’ forms the third official album. ‘The Course’ opens the album in fine fashion, featuring a strong distinctive throbbing industrial rhythm, fluttering higher pitched tones, metallic clanging structure and vocalisations delivered in a relatively subdued, distortion filtered style. This a blood boiling, fist pumping track and clear standout, where Frederikke demonstrates her skill of how to nail with clinical precision a structured industrial/ power electronics track. Although potentially referencing Pharmakon in relation to this this track may on face value seem entirely lazy (given both projects are part of a new generation of female fronted underground industrial/ power electronics acts), this comparison has far more to do with the clinically sharp sound and rhythmic construction of this opening piece, than any perceived similarity in vocal delivery or the fact that both projects are helmed by women. Following this extremely strong and focused opening cut, the sound takes a drastic left turn the following track ‘The Viewer’ is a lengthy and tensile cinematic styled soundscape with a muted undercurrent of rumbling bass, slow militant percussive beats, creaking metallic debris, shimmering atonal synths etc. ‘Gestures’ then arcs back towards a more focused style, where basic throbbing rhythms, atonal warbling synths and slow drawled vocals articulates a lethargic drugged out haze. The instrumental track ‘Pigs’ opens the second side of the album, with a layered militant thrum and hissing distortion textures, and whilst threatens at breaking out into all out sonic chaos, never actually eventuates. ‘Impure Fantasy’ is next and an another cinematic industrial soundscape styled track of sustained organ drones, abstract echoed layers, muted percussive textures and vocals which sit somewhere between spoken word and sampled movie dialogue. 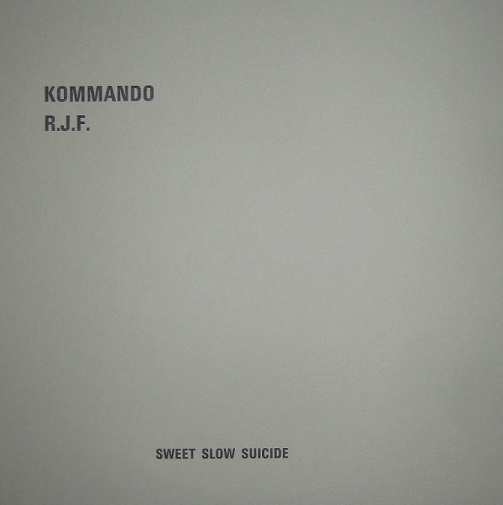 The title track concludes the album and is the most minimalist track on offer. Built with a basic and loose structure of slow menacing echoed bass layers, the track gradually coalesces into a vague structure as the screech distorted vocals are acerbically delivered. With three tracks per side, interestingly the album seems follows an almost template approach, where a focused industrial/ power electronics track is followed by a cinematic soundscape and rounded out by another loose industrial composition. Plan or coincidence? Not quite sure. Noting the myriad of sonic expressions on display, ‘Persona’ is a diverse and varied album which is ‘industrial’ to its core given all its aspects are captured under this broad stylistic banner. It is also a clear demonstration that Frederikke is not afraid to experiment with her chosen sound and direction for Puce Mary. Recommended.